Although the Desktop app on your Surface looks like a normal Windows desktop, don’t forget it’s just an app. And, as with all other apps, you still have the Charms bar at your disposal, making it easy to jump between apps. The Charms bar is the only portion of the desktop that’s finger-friendly, though. The desktop remains rooted in the mouse-pointer-controlled menus of yesteryear. 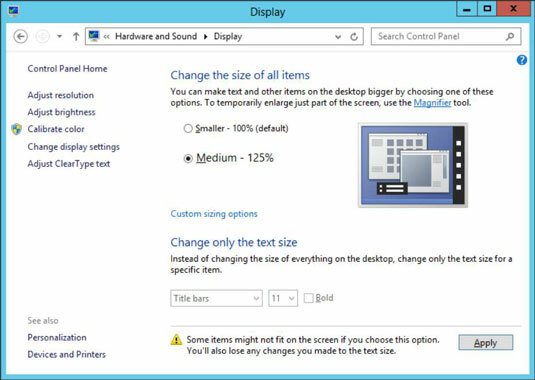 You can make things easier by telling Windows to make everything on the desktop larger. After you flip that switch, everything on your desktop expands. Following these steps packs less information onto the screen. But you’ll at least be able to take advantage of the information you see. And these steps are reversible, letting you return to mouse-sized controls if needed. Launch the Desktop app from the Start screen. The traditional Windows desktop fills the screen. Summon the Charms bar by sliding your finger inward from the screen’s right edge and then tapping the Settings icon. From the top of the Settings pane, tap Control Panel. The desktop’s Control Panel appears. On the Control Panel window, tap the Hardware and Sound category and then tap the Display link. In the Change the Size of All Items area, tap the setting Medium – 125% and then tap the Apply button. When Windows asks you to sign out of your computer and apply your changes, tap the Sign Out Now button. If you haven’t saved any work, save it before clicking the Sign Out Now button. If you don’t, your hard work disappears. When you sign back into your Surface, your desktop will be larger and easier to control by touch alone. The larger size affects only the desktop. Your Start screen and apps remain unaffected. If a crucial portion of a desktop window drops off the screen’s bottom, turn your Surface sideways; the desktop automatically rotates, leaving you more space along the desktop’s bottom edge. If you have a stylus for your Surface, don’t underestimate its power on the desktop. It works very well as a makeshift mouse, letting you select files and tap buttons, as well as enter and edit text.